On Saturday 31st May we will be having a High Mass in the private chapel of Milton Manor House. 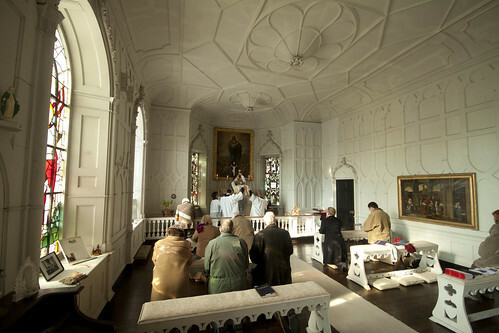 We have had many EF Masses there but this will be first High Mass I have organised, and that I am aware of taking place there, and we are making the extra effort to mark the 250th Anniversary of the purchase of the property by the Barrett family in 1764, who made Milton Manor a Catholic centre. The chapel was built hidden inside the house, although not exactly a secret attic chapel it is not easy to see from outside. Catholic places of worship, and the celebration of Mass, were still illegal. Mass will be at 11am; it will be the Feast of Our Lady, Queen. Milton Manor is off the A34, close to Didcot and Abingdon. 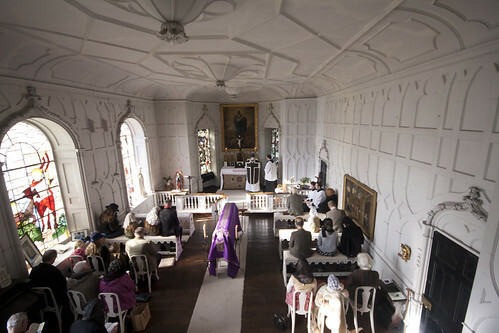 The chapel at Milton Manor is built in the ‘Strawbery Hill Gothic’ style of the early Gothic revival, and was consecrated by Bishop Richard Challoner in 1773. Challoner was Vicar Apostolic of the London District and the leading Catholic cleric of his day, who was a personal friend of the Barrett family and was first buried in the nearby churchyard. We are grateful to Anthony Mockler Barrett for his hospitality in allowing us to use the chapel.